Whether you’re updating your work gear or getting gear for the first time, check out these IA5016 Black Iron Age Ground Breaker 6” Met Guard Slip-Resistant EH Boots. They have everything you need for a comfortable, safe work day! These Iron Age boots feature ... (see full details) (see specifications) #IRAIA5016. Whether you’re updating your work gear or getting gear for the first time, check out these IA5016 Black Iron Age Ground Breaker 6” Met Guard Slip-Resistant EH Boots. They have everything you need for a comfortable, safe work day! These Iron Age boots feature a steel toe, so they’re perfect for meeting on-site safety regulations. The soles of these Ground Breaker boots are oil and slip resistant to help prevent falling injury. They’re also chemical resistant and they protect against electrical hazards. These slip-resistant boots utilize Kevlar stitching for quality. Kevlar stitching does not stretch or melt, has a tensile strength of up to 30 pounds, and will start turning to ash at 800 degrees Fahrenheit. The metatarsal guards on these black boots increase safety even more by protecting the metatarsal bones in the arches and balls of your feet from impact and crushing injuries caused by falling or rolling objects. The 6” met guard is threaded with the laces for a secure fit. These steel toe boots can handle any work environment! They are made with Goodyear Welt construction, so you can re-sole your men's boots and get an extended life from them. To keep your feet healthy and to reduce the occurrence of foot odor, you should choose a product that helps keep your feet dry. The uppers of these safety toe boots are made from full grain leather, which means it isn't buffed or sanded. Leaving the grain intact allows it to maintain its strength and integrity, while permitting it to breathe and release heat. This helps prevent excessive sweating and moisture build up when you wear these met guard boots. 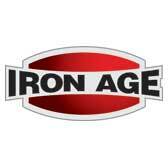 Iron Age offers even more wetness protection with mesh lining that helps wick away moisture. These Ground Breaker boots also features a removable EVA cushion insert with a sponge rubber heel wedge to keep you supported and comfortable during long days on your feet. Whether you’re buying your first pair of safety work shoes, replacing a worn out pair, upgrading your style, or changing your safety protections, these IA5016 Black Iron Age Ground Breaker 6” Met Guard Slip-Resistant Black Boots will give you the quality you expect and the safety you demand without sacrificing the look and appeal you want. These boots have pretty good insulation and great traction on slippery surfaces like oily concrete. It's great that they can be resoled, a lot of companies don't build footwear that's meant to be repaired. For steel toe shoes they're surprisingly comfortable, and the met guards move with your foot instead of digging in. I do production torching for a scrap yard. These boots are comfortable and have held up to the heat and abuse I put them through. I would buy another pair without a second thought. And would highly recommend them to anyone that does my type of work. I just got these boots. So far they are really holding up to high temps and very comfortable. I've paid three times as much for other boots that failed under my work environment. Will keep you posted for the long haul. Iron Age Boots: Mens IA5016 Black Ground Breaker Met Guard Steel Toe EH Work Boots is being added to your cart.